The Pacific Palisades Community Liaison Committee met with Caruso Affiliated on Oct. 6 to discuss different haul-route options when excavation begins for Caruso’s three-story underground parking structure. At the meeting, the committee was told that Caruso’s preferred route is to have trucks go south on Swarthmore, take a left on Sunset Boulevard, then a right on Chautauqua, a right onto Pacific Coast Highway and north to Potrero Canyon to deposit their dirt. Coming out of Potrero Canyon, trucks will take a right onto PCH, then a right onto Temescal Canyon Road, driving past Palisades High School and turning right onto Sunset Boulevard. Trucks will turn left off Sunset onto Swarthmore. 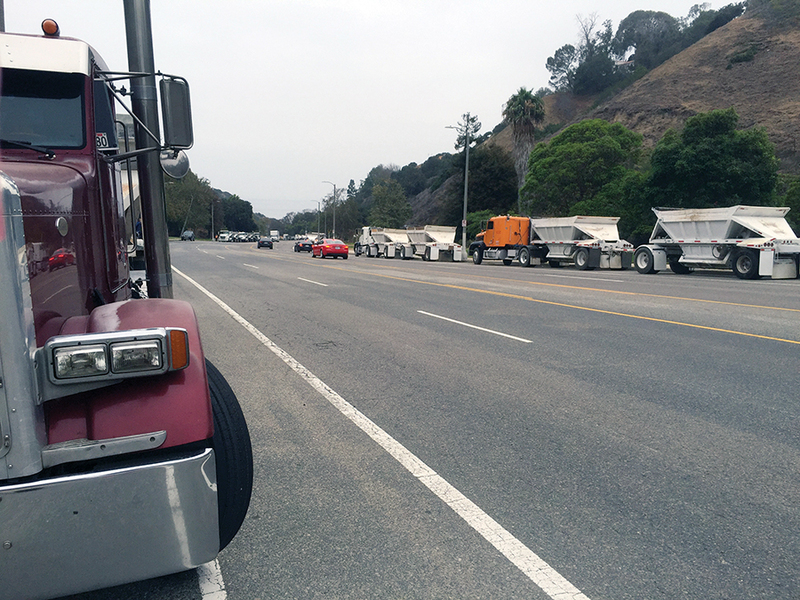 Trucks are lined up on both sides of Temescal Canyon Road early morning. Caruso estimates that nine trucks per hour will depart Swarthmore, with a maximum of 100 truckloads a day from 7 a.m. to 6 p.m., six days a week. Hauling is scheduled to begin in November and last an estimated 12 weeks. Although a temporary stoplight was installed at the entrance to Potrero Canyon for prior hauling, Caltrans, according to what Caruso Affiliated told the committee, has so far declined to re-install the left-turn light, which would allow transporting dirt down Temescal Canyon Road, instead of using Chautauqua. Two kinds of trucks will be used, one an “end-dump” truck (a single long unit) and the other a “bottom-dump” truck, which is a two-unit extension. Caruso will pay for four crossing guards from 7 to 9 a.m. and 1 to 3 p.m. on school days. Three will be on Sunset (at Monument, Swarthmore and Via de la Paz) and one at Temescal Canyon and Bowdoin (high school).